How long after you became a mama did it take you to put away the chunky necklaces and the dangly earrings? How sad were you when you realized babies and jewelry don't always mix very well? Posh Baby Boutique is offering my readers a giveaway of Smart Mom Jewelry Teething Bling® — fashionable and functional jewelry made just for moms! The pendants are made of a nice, squishy, safe silicone. Your baby can't hurt it! That's right: Smart Mom jewelry was designed for babies to chew on. The silky cord that hangs around the mama's neck also features a breakaway clasp as an added safety feature. And the best part? The necklaces look great! 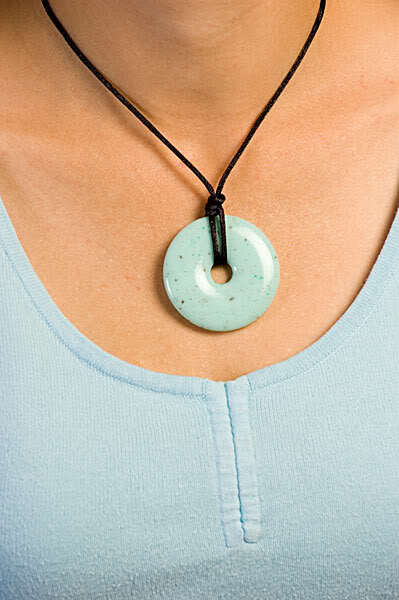 They come in heart shape or donut shape pendants and many different stylish colors and patterns. No one will know your necklace is baby-approved … until your baby starts gnawing on it and you don't object! I haven't been able to test out the Smart Mom necklaces personally since I don't have someone's who really the age for it anymore! But Stacy at Posh Baby Boutique (and blogging at Posh Trendy Blog) was super kind enough to let me post this giveaway quickly, so I really appreciate that. I'll give you my long-distance take on the Smart Mom necklace, and then you can try to win a free one and see what you think for yourself! I love that the material is a high-quality, phthalate-free, federally approved silicone. It's non-toxic and latex-free, which is good because there are a number of people with latex allergies. Silicone is soft and pliable and ideal for massaging a teething infant's gums. The silicone is food–safe (you might have a silicone pan or two around your kitchen) and even dishwasher-friendly if it comes to that! The design of the pendant and cord is simple, and I find it quite elegant. I like that there are many different colors to choose from, some funkier and some more low-key. You should be able to find a style to suit your taste — or choose a bunch to match each outfit! Because of the streamlined design, this is the kind of necklace you could wear every day. It would make a lovely and understated signature piece. And then imagine everyone's surprise when you pop it in your baby's mouth! There are coordinating bangles to match the necklace, and you can also buy gift packs for yourself or the new moms in your life. If you're not the necklace type, or you want a gift for someone who's not (the dad, perhaps? ), there are also Teething Bling keychains: same teething pendant but in a pocketable key ring style. The silicone could theoretically be bitten through, so Smart Mom cautions mothers that it's to be used only on babies who are teething, with teeth only just emerging. Keep an eye on your little chewers to make sure the jewelry looks safe and whole at every use. The cord has a breakaway clasp for added protection, but it's in no way intended to go around your child. The necklace should be worn by adults only, and it should be used by your baby only under adult supervision. Otherwise, the cord could pose a choking hazard. A couple people think the cord design is cheaper looking than they'd hoped. I believe the makers used a cord rather than a chain for safety reasons, but keep that in mind if your style is different. Personally, I checked out many baby-safe necklaces when I needed a nursing necklace, and I would have been thrilled with something this elegant; at the time, all I could find were toy-like necklaces that would have looked better on the baby. Some have mentioned that the silicone attracts lint and dust, so keep a soft cloth handy (you probably have one in your diaper bag already!) to wipe off anything you don't want your baby to mouth. The funniest negative comments to me were people docking the necklace a star for being too popular with their baby! A couple mamas complained that now their baby thinks all jewelry is meant for chewing, or that their babies couldn't keep the Teething Bling out of their mouth whenever they saw it. I'd say those are positive attributes, but that's just me! I didn't want to post their pictures here without permission and am too lazy to get said permission — yep, you heard it here — so click on over if you're curious about seeing the Teething Bling in action! I'm confident that you and your baby will enjoy the Smart Mom Jewelry Teething Bling. And I'm equally confident you'll enjoy the Posh Baby Boutique. You really have to check out Stacy's store. Many items are custom-made, personalized, and/or mama-designed (just like the Smart Mom Teething Bling). You can enter giveaways for just such fantastic items on Stacy's own blog, Posh Trendy Blog. You can find Smart Mom Teething Bling at Posh Baby Boutique at $19.99 for a pendant and cord necklace, $16.00 for a keychain, and $34.00 for a gift set that includes a necklace, two bangle bracelets, and a gift card (perfect for a unique baby shower gift! ), or on Amazon. Giving a Smart Mom necklace would be like giving two gifts in one, because it's partly for the baby, but it's also a way to show you care about the mama. No one wants to feel frumpy in those postpartum days, after all, and I just love the idea of functional jewelry that's still stylish. If the mother intends to breastfeed, it's also a way to support her in her decision by giving her a tool that will come in handy when she needs it. Baby Boutique, enter in the comments below! Contest is open to U.S. & Canada. MAIN ENTRY: Head on over to Posh Baby Boutique and tell me which Smart Mom pendant you would choose! Tell me why you want this necklace! Have a look around Posh Baby Boutique, and tell me another item that catches your eye. Follow Posh Trendy Blog through Google Friend Connect, or subscribe to the Posh Trendy Blog RSS feed in a reader or by email. Like (become a fan of) Posh Baby Boutique on Facebook. Like (become a fan of) Hobo Mama on Facebook. Do something lovely for this post, a post on Posh Trendy Blog, or a post on Hobo Mama (StumbleUpon, Twitter, Facebook, Digg, etc.) and let me know what it was and which post in your comment. There is a Share button below each of my posts. You can gain 1 extra entry per share, up to 3 extra entries total. Put my Carnival of Natural Parenting button on your website for 2 extra entries. The HTML code is in the sidebar. Leave your site URL in the comment. Hobo Mama Reviews is giving away a Smart Mom Teething Bling pendant necklace from Posh Baby Boutique. Smart Mom teething necklaces are made of a soft, FDA-approved silicone that babies love to chew! It's the safe and stylish way to keep your baby happy, no matter where you are. And when your baby isn't using the necklace, you'll enjoy the fashionable elegance of the donut- or heart-shaped pendant hanging on a silky cord. 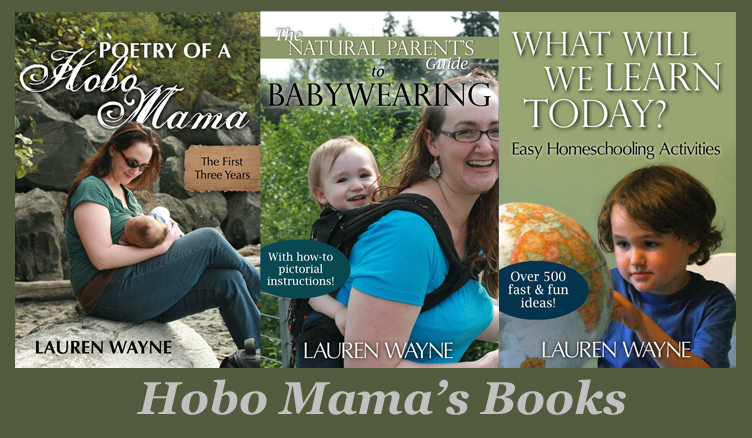 Enter at Hobo Mama Reviews by June 17 for your chance to win! Contest open to U.S. & Canada. For tasks that garner you multiple entries, say something like "I blogged [link here] #1," "I blogged [link here] #2," etc. Contest closes June 22 at 11:59 p.m. PDT. Disclosure: I received no compensation or product for this giveaway. Amazon links are affiliate, because I need to pay the bills, yo. I want the Jade Donut Shaped Pendant! I want to win this b/c I only have a mommy necklace but it's not for teething! ANd Collin is in FULL BLOWN teething mode! I want to get a Bubele Bums cloth diaper. I won one and I want more!! They are awesome! I think I would choose the Peridot Circle Pendant. I lost my last nursing necklace (it has to be here somewhere!). I subscribe to this blog! I think the onyx donut shaped necklace would be my pick! I want to win this 'cause it'd be great to finally have a teething toy that won't fall on the floor at church! I like you on FB, I love the Black Damask with hot pink and black polka dot Dress for my only niece who turns 1 tomorrow & the teething necklace would be perfect as my niece will be a big sister in December! I would love the Mother of Pearl colored donut shaped pendant! I'd probably choose the peridot or the bronze one. I want this necklace because I lost mine, and they're wonderful for teething babies! I also like the Michael Miller Spa Blue and Brown Dandy Damask Wipes Case. I follow Posh Trendy Gifts blog. Signed up for the the newsletter. i'd like this necklace because i've got a new babe on the way (insert high-pitched squeal here) and it would be nice to have some jewelry that's ok to be gnawed at. i looked around a bit more and think i'd also like some posh pads. though i didn't have much leakage issues last time, i did have supply issues. hopefully that wont repeat and i'll be leaking all over the place! I would choose the Jade Donut Shaped Pendant. I would love this necklace because it would make a great gift for a special friend! Visited Posh Baby, looked around and LOVE the Lime Star Paisley Stroller Blanket. Follow Posh Trendy Blog through GFC. Signed up for Posh Baby newsletter. Follow Posh Baby Store on Twitter as AMomsWord. Follow HoboMama on Twitter as AMomsWord. Pink Cupcake Donut Shaped Pendant. My son thinks all jewelry is for eating and playing with already, so might as well give him something I don't mind him pulling on. I love love love love LOVE Moonstone Donut Shaped Pendant! What a great idea!! I would LOVE to win this necklace (and even if I don't I plan on buying one) because my son is infatuated with my jewelery He is ALWAYS pulling on it trying to put it in his mouth. I constantly take it off because I know he is going to hurt himself by playing with it. I would feel at ease knowing he is safe doing whatever he wants with my jewelry and I would still be styling with my beautiful necklace! Signed up for the Posh Baby Boutique email newsletter. fan of Hobo Mama on Facebook. Hobo Mama on Networked Blogs on Facebook. I'd like the Pink Cupcake Donut Shaped Pendant. I want this necklace because my daughter is teething right now and always needs something to chew on. I entered the Steampotville giveaway. I would choose the bronze teething bling pendant! I want to win this because my baby is both teething and the kind of breastfeeding baby that likes to grab at my hair or eyes while he eats. Having this might distract him! I would love the Onyx and Pearl Gift Set (or just the Onyx necklace) because black goes with anything! Sasha has been teething pretty much since we brought her home. She is 8½ months now and teething harder than ever! Also, I found these online while I was pregnant and loved them! Then our Bradley instructor had one for us to see. I want one! I already have the blue camo donut shaped one, I think I would like the blue camo heart shaped one!! I want this because I have one and love it!! It is perfect for my little 3 month old early teether. i like the moonstone one! I would choose Mother of Pearl Donut shaped pendant. I have a baby due in Sept and will spend lots of time nursing. I like the brown snowflake! I would choose the Peridot Donut Shaped Pendant. I like the moonstone pendant. I want to win cause my little guy just started teething and is chewing on everything! I want the Little Star baby booties. Too cute! I want this necklace for my mom actually. I think it is one of her great joys in life to play with babies in church, and she always has (and uses) jewelry on that attracts them. She would LOVE this idea. I subscribed to your RSS feed using Windows Live Mail on my new CPU now that I got it up and running. Yay! I love it! I never really saw RSS this way. Thanks! Remember I set up an RSS Feed on LiveJournal? Well I had done it wrong. I've submitted a request to have it fixed. I'll let you know when it is, but I thought that might be worth an extra entry. ;-) I'd really love to have this Teething Bling! I want the necklace to feel pretty again! I would pick the Peridot Donut Shaped Pendant! I would choose the Mother of Pearl Donut Shaped Pendant, it would go with everything! I want this necklace because I am pregnant with my 3rd child! It would've come in handy with the first 2, I had to forgo wearing necklaces the whole time they were teething! I love the BabbaCover 'BeepBeep' Green in Snuggle Fleece, it's adorable! I subscribe to Hobo Mama's RSS feed. I would love the jade donut shaped necklace! My daughter is teething big time and loves to tug while breastfeeding - perfect! I love the pink camo heart! Is it wrong to make my baby boy chew on a pink heart?? I want this b/c I have 1 blue camo one and my 3 month old loves it! It saves my skin from scratching, it's the only teething item that has worked with my early teethers, and dang they are so cute!!! I really love the Onyx Donut Shaped Pendant. I would love this necklace because I have one that I loved wearing with my first & at the end of the year I'll be expecting my second. I'd love to have another one to wear with some different things. After looking around on the site, I love the cherry cupcake flutter tutu outfit. I find out if I'm having a boy or a girl in the next couple of months & would love this if we're having a girl. I follow Posh Trendy Blog through Google Friend Connect. I follow www.HoboMamaReviews.com publicly through Google Friend Connect. I Like Posh Baby Boutique on Facebook. I definately like the blue camoflage the best. I also really like the pink and espresso lolli dot diapering gift set. I love the cotton candy blue necklace! I'd love to have the necklace because it's pretty and functional. My LO loves to hold my neckline or necklace while he nurses. He's not teething just yet but he still loves to put everything in his mouth! And how pretty!! My baby is teething so I need one of these.My sister bought one and her little one loved it!